This is a story about the challenges of a new sibling entering into the family (in this case, a skunk family). Frances feels left out and unimportant; her dress doesn’t get ironed before school, and there are no raisins for her oatmeal. “Things are not very good around here anymore,” she says, and decides to run away. She packs her things and runs away to the dining room. Her parents talk about how much they miss her, so as to be deliberately overheard. “A family is everybody all together,” they say. She comes back and her mom makes a chocolate cake. 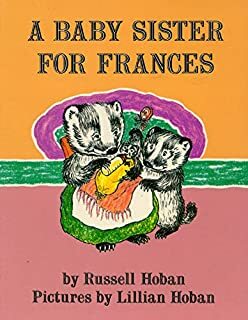 This story about a rabbit family has almost the exact same plot as A Baby Sister for Frances. Rosie struggles to compete with baby Mat for Mama’s attention. Rosie tries to help by shushing Mat, then taking him outside to play, but she gets in trouble for this. She packs her things and runs away to sit under a tree, far enough to see her house but not be seen. She reflects how even if Mama doesn’t miss her, Mat and dad will. She comes back and bakes pies with Mama. This story begins with a mystery; the children wake up to strange noises coming from the kitchen. They investigate and find mother and father dancing around while washing the dishes. When they are discovered, their parents pull them in for some whole-family dancing, then gently put them back to bed. There is a strong atmosphere of love and acceptance. There is no sibling rivalry or competition. In all three books, children are indulged. Frances is allowed to “run away” and then provided with affection that compels her to choose to come back on her own. She negotiates for a higher allowance because she’s a big sister now. Rosie also runs away and is welcomed back with hugs and pie-baking. Rosie does get reprimanded for taking Mat outside by herself (and getting him dirty), but the feeling is exasperation rather than anger. These messages can help children work through their own feelings of frustration and sibling competition for attention without fearing punishment. The children in Kitchen Dance are not chastised for getting up at night, but instead embraced and included. 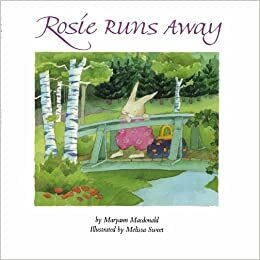 The magic in this book, I think, is the fascination kids have with the mystery of what adults do, once the kids are in bed, and the feeling of being drawn in and loved and included in that special time. Kitchen Dance departs from the traditional view in that both parents share the domestic duties equally – washing dishes and putting the children to bed. They are equally domestic and nurturing. We don’t get to see what they do for work or childcare during the day. All three families are two-parent families with a mom and dad. No extended family are present. The first two books have animal protagonists, but they feel very “white.” Kitchen Dance is explicitly hispanic. The father sings “Cómo te quiero,” a phrase that is repeated multiple times in the book. The family members all have dark skins rendered with beautiful colors. The theme of conflict between a single child and a new sibling is one with enduring appeal and relevance. Still, I was surprised to see almost exactly the same plot in books written 26 years apart. 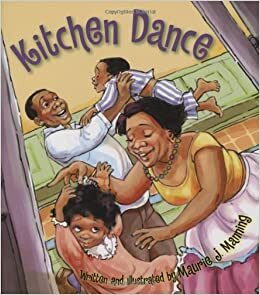 Kitchen Dance portrays sibling dynamics in a subtle way; when the narrator (the youngest child) wakes up, she wakes her older brother to include him in investigating the noise, rather than seeking out parent time for herself. There is also a consistent theme about food providing comfort. At the conclusion of the first two books, the family celebrates being back together by baking a cake or a pie. Kitchen Dance occurs in the aftermath of (presumably) a family dinner. From this small sample, I would conclude that traditional family structures and gender roles continue to appeal to authors, illustrators, and readers. Our lecture notes for the week discuss the 1980’s and 1990’s as a time when working mothers were more recognized and social issues like divorce and out-of-wedlock pregnancy began to be portrayed, but these books don’t touch on any negative aspects. Overall, I enjoyed having this chance to dive into the world of picture books!